The plant has been known in aquarium hobby since 1980s, but it has already become one of the most popular tank plants among the professionals working with creating of planted or so called natural aquariums. Glossostigma elatinoides originates from New Zealand, Tasmania and South-East Australia, where it grows next to water in bogs and lowlands. The plant belongs to Scrophulariaceae family. This is a beach plant by its nature and it gets flooded from time to time. That’s why it successfully grows out of water and in this case it blooms profusely in summer. Glossostigma elatinoides is a small sized plant and the carpet which it forms is very thin; it can be up to 1 cm thick. The plant has rounded light green leaves up to 5 mm large. The length of its internodes is about 1 cm, but it can be about 5 cm long – which means that the plant spreads out around and above rather actively and this fact makes taking care about Glossostigma elatinoides carpet a bit specific. Provided with favorable conditions bubbles of air may appear on its surface as a result of an active photosynthesis process occurring there. The plant grows quickly. Several bunches planted close to each other form a thick smooth green carpet in several weeks. The leaves start to superimpose on one another and they resemble something like a green coat of mail from above. Taking care about the plant is quite challenging and it isn’t likely to be within the power of a beginner aquarist. To make Glossostigma elatinoides grow healthily you will need special fertilizers and additional supply of CO2 into the tank. Despite the fact that the plant grows on the tank bottom, it requires high level of illumination, which must be taken into account when placing it in the tank. Glossostigma elatinoides is one of the fast growing aquarium plants, which as a rule grows about 2-3 cm (1 inch) tall. However, provided with high illumination level and additional CO2 supply it can grow even smaller. The carpet requires trimming from time to time to maintain its proper appearance, otherwise the plant may tear off from the substrate and float to the water surface. High growth rate leads to the situation when branches of horizontally growing shoots start to shade each other and grow longer to reach the light. Therefore it is recommended to cut off vertically growing stems of the plant. Glossostigma elatinoides cultivation is rather challenging. It requires high illumination level, quite soft (2 — 8°dGH) and slightly acidic (pH 5-7) water with temperature from 22°С as well as occasional fertilization. Tank bottom substrate is the second important thing after the illumination level. It should have smooth edged grains about 2-3 mm large. The plant has very long and thin roots and soft substrate promotes deep penetration of the latter into it. If there are some areas with large grained substrate in the tank, the plant can’t form a good looking carpet there – it either grows deep into the substrate, or forms its shoots high above it. By using such a substrate you can limit propagation of the plant, where you don’t need it. You can use glosso is aquascaping only at the condition of high illumination level in the tank. At that obtaining of the thick carpet is possible only when illumination value is more than 1 W/l as well as daylight duration isn’t less than 10 hours. The plant won’t die at low level of lighting or without additional fertilization, but at such conditions it won’t behave as a ground-covering plant and it starts to grow upwards to reach the light, it becomes more than 10 cm long. High illumination level requires additional CO2 supply (20-30 mg/l) and periodical fertilization, which is a must. 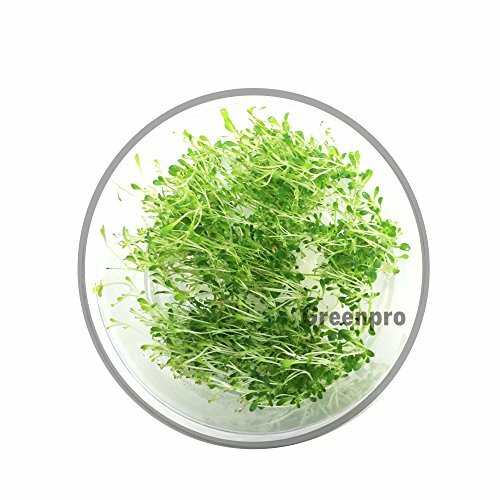 Due to high growth rate of the plant, introduction of ferrum containing fertilizers is necessary to ensure saturated green coloring of the latter. Glossostigma elatinoides propagates due to its trailing stem, its new small roots grow from it. When planting Glossostigma elatinoides you should divide it into separate verticils with two leaves each and plant them 1-2 cm far from each other. By means of pincers bury the stem completely into the substrate to make sure that the plant won’t float as well as that later it will strike roots to stick to the substrate firmly. Provided with proper care in about a month you will have a nice green Glossostigma elatinoides carpet in your tank. You should trim it from time to time, otherwise once it becomes about 5 cm tall, it may tear off from the substrate and float to the tank water surface. This happens when the tank lighting and nutrients have poor access to the bottom level of the carpet and as a result this layer rots off. It is very easy to trim Glossostigma elatinoides carpet. You should do this by holding scissors at an angle of 45 degrees, but you don’t have to be extra careful at that. If you accidentally tear some of the shoots off the substrate, don’t try to plant them back. This way you will just break the wholeness of the substrate and the rest of the shoots will float as well. That’s why it is better just to cut off such a shoot. To make sure that the plant forms a short nice green carpet, you have to cut off its old yellow rotten off leaves. If the plant leaves are severely infected with algae, remove such a bush and put a healthy one instead of it. Just a week later your small Glossostigma elatinoides lawn will look as good as new.